The Riverside County Sheriff’s Central Homicide Unit is requesting the public’s help in identifying three suspects seen in this flyer, involved in the daytime residential burglary in Eastvale, on December 23, 2017. 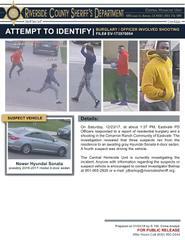 The suspects are described as Black male adults, 18-28 years, thin to medium build, who fled to an awaiting 2016/17 gray Hyundai Sonata, driven by an unknown suspect. On December 23, 2017, around 1:37 p.m., deputies from the Jurupa Valley Station, assigned to the contract city of Eastvale, responded to a report of a burglary and shooting that just occurred in the 6400 block of Caxton Street, Eastvale. Deputies arrived on scene and met with the homeowner, an off-duty Pomona Police Officer. Two residents were inside the home, when they heard several subjects inside the residence. The off-duty officer armed himself and confronted two suspects in an upstairs room. After confronting the suspects at gunpoint, the victim fired several times at one suspect after the homeowner feared for his life. All of the suspects fled the residence and remain outstanding. Deputies received information from the victims and neighbors who described the suspects as three Black male adults, 18-28 years, thin to medium build, who fled in a gray Hyundai. Additional deputies and investigators from the Jurupa Valley Station arrived to secure the scene and canvas the surrounding areas. Investigators from the Central Homicide Unit responded and assumed the investigation. During the investigation, investigators found signs of forced entry into the residence. Anyone with information regarding this incident can contact Investigator Martinez at the Jurupa Valley Station at 951-955-2600, or Investigator Bishop at the Central Homicide Unit at 951-955-2777.